We have Private Lender Money, and have been authorized to help people in the toughest situation get into a good reliable and dependable car. We have Down Payments as low as $999 OUT THE DOOR!!! Recently Moved to the Country? New Job? Collecting Unemployment? Recent Judgements, Wage Garnishments or Divorce? Good Credit? Bad Credit? No Credit… NO PROBLEM! Every vehicle Financed by Prestige Motor Works is eligible for a Full Power-Train Warranty for the Duration of your payments! No Jokes, No Gimmicks, No Kidding. Call the owner direct to discuss your situation and to be pre-approved for your next Prestige Motor Works Car! Call Alex at (630)780-6439. By combining the car buying and financing processes into one, we make acquiring your new vehicle a quick and convenient experience. With todays' tight credit markets and high rates of default on car loans, obtaining financing is no easy task and often involves interest rates over 30%! 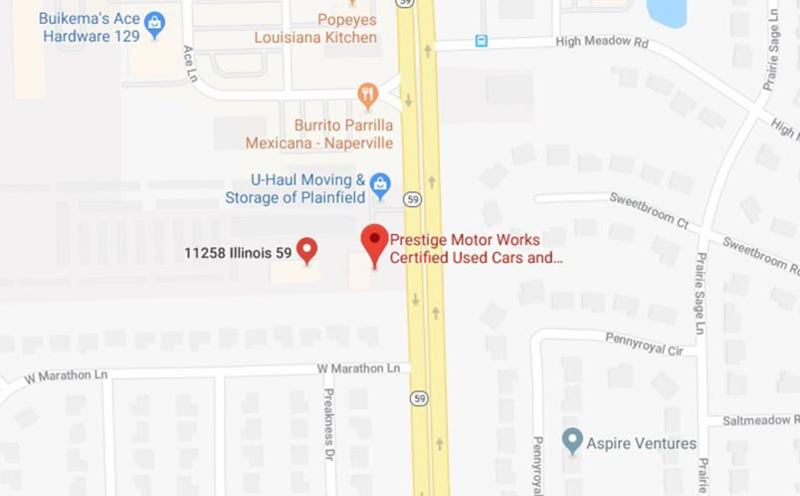 That is why Prestige Motor Works is one of a handful of dealers in Illinois that provide their customers the opportunity to use their Visa, MasterCard, and Discover cards to purchase a vehicle from us. Furthermore, we have recently been able to acquire additional finance sources that allow us the ability to work with challenged credit customers. We put good people into good cars, at some of the lowest interest rates in the state of Illinois; we have Down Payments as low as $999 and our interest rates from .49-27.99% APR! Call the owner direct to discuss your financial situation or fill out our 30 Second online credit application today! Even if you have been turned down by multiple dealers in the area, take just 30 seconds and fill out our Credit Application. With Private Investor Funds, and good long-term working relationships with our lending partners, 100% of all Credit Applications will be Approved on the spot. All banks and financial institutions look at a dealerships' reputation, track record, and time in business before offering special financing options to their customers. We have an excellent reputation, proven track record, and are known for taking care of the needs of every Prestige Motor Works customer. These factors give us the unique ability to provide you with down payment and financing options specifically tailored to your needs. No other used car dealerships can even compete with our financing offers! Take a few seconds to fill out our credit application and see which vehicles you WILL be approved for today.